Professional Local Movers Since 1975 ! We're happy to provide a quote, answer your questions and discuss your moving needs. We're ready to quote your move! Just Point And We'll Do The Rest! 4/6/2015 Performed above and beyond! John at Thrifty Moving was terrific to setup our move. The crew, Cliff and Oscar, arrived right on time and it was amazing watching them do the incredible job they did. Our furniture was BIG and HEAVY and the destination was up three flights of stairs. Their strength, skill and stamina should be an example to all of us about how training, smarts and being fit you have to be to do this incredibly difficult job. They wrapped everything with moving blankets and binding plastic to keep it safe and performed above and beyond when getting the gigantic couch into our tight apartment door. No complaints what so ever. 5/2/2014 Who would ever think moving could be simple! Who would ever think moving could be simple! From the moment I spoke to Mark setting up the move whom was very reassuring until the last piece of furniture was packed then unpacked by Jim and Ed whom were smiling and very good natured even after going up and down three flights of stairs! I consider this to be the best of the best when it comes to personal service and moving!!! A definite must use if and when you move!! I give them all five stars! Keep up the good work Jim,Ed and Mark!!!! Why Thrifty Moving & Storage? THRIFTY MOVING AND STORAGE has been successfully moving families and Business in Walnut Creek, Concord Ca and surrounding areas for over 35 years. 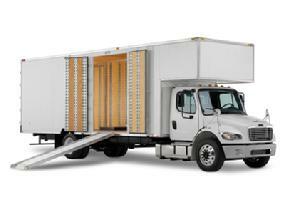 We offer a wide variety of moving services to meet your budget and requirements. Understanding your needs is important to a successful move and our team will work closely with you for your unique moving situation. We offer that extra service and pride in our work that is only found in a family owned business. If it's important to you it's important to us. Many local movers quote low hourly rates then hit you with a lot of hidden fees... Not at Thrifty Moving. In fact we offer extras for FREE that other movers charge for like FREE use of 4 wardrobes, FREE shrink wrapping and NO credit card fees. All of our moves are performed by full time, highly experience uniformed Thrifty Moving employees and your move will never be subcontracted or resold on the internet. We're looking forward to meeting you in the future and welcome the opportunity to earn your business. For your peace of mind we Guarantee our move dates. All of our moving trucks are equipped with GPS tracking, we know the location of your items every step of the way. When it comes to successful Walnut Creek, Concord Ca moving it's all about training and crew experience. We're proud to say Thrifty Moving has some of the best movers in the relocation industry. We have spent years assembling the best moving team possible because we value your business and we want you to have an excellent moving experience. With all moves we come prepared and protect your home as well as your furniture to minimize the risk of damage. This includes blanket-wrap, floor protection, free shrink-wrap service! 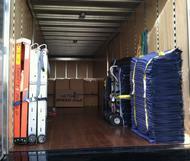 Our moving trucks are fully equipped with Furniture Pads, Dollies, Floor protection, Ramps and Wardrobe Boxes. All of your furniture will be carefully padded and sofas shrunk wrapped free of charge. 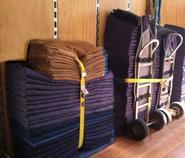 Just some of the extra we offer free for all our moving customers. Some of the many reasons Thrifty Moving is unlike your common mover. We're not a Broker or Re-seller. We are full service moving company servicing the Bay Area for over 35 years. Your moving dollar stays in our local community. We offer complete packing services but doing your own packing will significantly reduce the cost of your move. It is commonly believed that large items such as sofas and refrigerators contribute most to the cost of a move. However it's the smaller items in a household that can take more time. You can reduce your cost by moving small items such as pictures, lamps and plants. Value is important especially in our current economy and having a efficient crew and the proper equipment can certainly be a time and money saver. Our crews are trained in professional packing, moving and storage techniques saving you time and money. Always ask the important questions when comparing Moving Company rates like are you licensed and insured? (You would be surprised how many are not and it's illegal and dangerous! Don't let them in your home!). In addition to your hourly rates are there any fees? (Many movers love these hidden fees, like 18% fuel charges, 10% workman comp fees, 3% credit card fees, 5% PUC fee by the time they're done the rate is 36% higher than you expect). Do you charge for tape? ( Some movers charge $10 a roll to use dozens of rolls of tape unnecessarily on the furniture pads or re-taping your boxes costing hundreds of dollars). When does your time start? ( Many Walnut Creek moving companies charge an additional half hour or more to get to your home and that is money lost on wasted crew time not moving your furniture). You will NEVER find any of these hidden cost at Thrifty Moving! Over 90% of our moving trucks are Non Diesel and we recycle our packing supplies and shrink wrap.